Dhaka, April 8 2019: TVS Motor Company has launched four new two-wheelers in Bangladesh. The products include premium motorcycle TVS Apache RTR 160 4V single disc, 125cc motorcycle TVS Max 125, 100cc motorcycle TVS Metro special edition and utility vehicle TVS XL100 Heavy Duty ‘i-Touch Start’. These products will target the growing customer demand in each of their respective segment. TVS Apache RTR 160 4V single disc variant will be available in Carburetor version. The TVS Apache RTR 160 4V gets a 159.7 cc, single-cylinder, 4-stroke, 4-valve, oil-cooled engine that churns out 16.5 PS @8000 rpm and 14.8 Nm @ 6500 rpm. The engine is mated to a 5-speed super-slick gear box that offers a precise and powerful riding experience. Staying true to its racing pedigree, the TVS Apache RTR 160 4V has a powerful 160cc engine, enabling the best performance in its class and boasts of a top speed of 113 kmph. Complete with best-in-class power-to-weight ratio, the motorcycle does an astounding 0-60 kmph in 4.73 seconds. The motorcycle comes in colour selection of RR red, racing blue and racing black. TVS Max 125 is a motorcycle boasting a 4-stroke engine with a 123.53cc displacement. The motorcycle has a power 8.1kw@8000rpm and a torque of 10.8Nm@5500rpm. 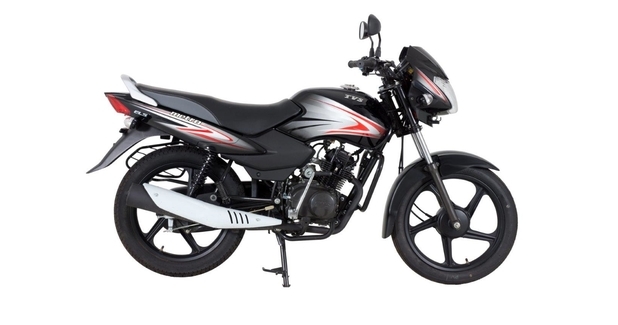 Equipped with front disc brake, TVS Max 125 comes with telescopic front and series spring rear suspension. The motorcycle offers secure storage in the space below the seat, a provision to charge cell-phone and is available in colour selection of black red and black blue. The TVS Metro special edition comes with new graphics, longer seat and 3D Chrome logo. Adding further to the style element, the 100cc motorcycle, now has a new pillion handle and stylised mirrors. It will be launched in KS Mag and ES Mag variants known as KLS and ELS respectively. TVS Metro series has always been associated with superior mileage. The Econometer feature allows the rider to ride in economy mode (green) for the best mileage and power mode (yellow) for the best power. The motorcycle comes with a 4-stroke DURALIFE engine with maximum power of 5.5kw@7500 rpm and maximum torque of 7.5 PS @7500 rpm. It is available in colour selection of black red and black blue. TVS XL100 Heavy Duty comes with an electric start technology called ‘i-Touch Start’. The vehicle is also powered with a high spark energy engine that provides solid performance with great pick up. It comes with 99.7cc four-stroke engine with maximum power 3.20kW@6000rpm and maximum torque 6.5Nm@3500rpm. TVS XL100 Heavy Duty ‘i-Touch Start’ has a wide platform with a detachable rear seat, USB mobile charger as an accessory and is equipped with heavy duty ‘DuraGrip’ tyres. The utility vehicle is stylish with striking graphics, attractive LED Daytime Running Lamps (DRL) and sports a vibrant ‘Heavy Duty’ logo. The vehicle is available in a colour selection of black, blue, red and purple. All the vehicles will be available in TVS Auto Bangladesh showrooms across the country.